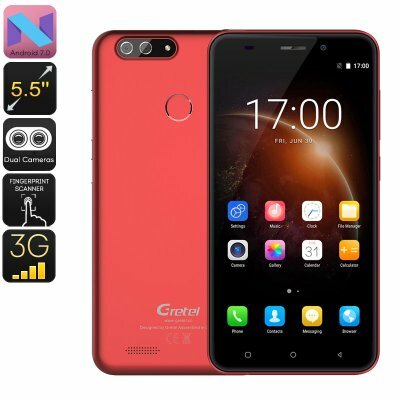 Successfully Added HK Warehouse Gretel S55 Android Phone - Quad-Core CPU, Android 7.0, Fingerprint, 5.5-Inch, 2600mAh, Dual-Rear Camera, 3G (Red) to your Shopping Cart. For those of you that are looking for an affordable Android phone, the Gretel S55 certainly is a device to consider. This cheap Android phone runs on an Android 7.0 operating system. Thanks to this, it will treat you to a smooth user experience while you enjoy the latest software features. On its 5.5-Inch HD display, you’ll be able to watch movies and play games while enjoying great visuals. This screen supports the IPS technology which means that you’ll be treated to vivid colors and high details no matter your viewing angle. Simply go to Google Play to download your favorite Apps, films, or games. This Android smartphone is sure to meet all your mobile media demands. Your Android phone comes with a sophisticated Quad-Core CPU clocked at 1.3GHz. Thanks to this, you’ll be able to enjoy all basic Apps without dropping a frame. It furthermore packs 16GB internal storage and a 32GB SD card slot. This will provide you with enough storage to keep all your latest downloads. With its 2600mAh battery, it lets you enjoy all it has to offer for up to 10 hours in a row. With its Dual-IMEI numbers, the Gretel S55 brings along great connectivity. You will always be reachable on two phone numbers at the same time which makes it great for separating work and private life. The cell phone furthermore supports 3G which means you can browse the web wherever you are. Whether you like to make online calls, download files, or stream movies – this cheap Android phone supports it all.